What writing advice would you give aspiring authors? My advice to you for the moment is to just write. Write, write, and write. And read a lot too. Whenever you’re hit with a new plot, jot it down immediately, whenever you’re hit with a new idea, then run to your computer. And if you’re not hit with any of those, then still run to your computer. You see, there is no such thing as ‘waiting for inspiration’. That’s the silliest thing to believe and all writers know it. Sure, you may come across moments when you really do feel ‘inspiration strike’, but believe me when I say, don’t count on it, don’t wait for it, and don’t make your book depend on it! No, instead what you’re meant to do is sit in front of your computer [or take out your notebook] and literally stare at that blank, white paper until ideas begin to form in your mind. Sounds even sillier doesn’t it? But boy, does it work! See, the trick is in being persistent, relentless, and very, very patient. I’ve come up with entire chapters using this process. And eventually, a book. [A short story too, but essentially a BOOK]. What publishing advice would you give aspiring authors? Well, hmm actually, let me rephrase that. Do not think about the publishing process until your book is complete. For now, just write your heart out. Don’t worry yourself too much. Remember these golden words: Where there’s a will, there’s a way. After all, the process of publishing can only happen once you have your very own completed book before your eyes, so…. Do you brainstorm your plots and characters beforehand or create them as you write? A bit of this and a bit of that. I always start out with some plot in my mind, an overall picture of what the book will be about. But I don’t get into the nitty gritty of imagining what will actually happen in the book, or who the characters will be. Of course, in my mind, I have some slight idea of where the book is heading but that’s all. So, for me, most of the scenes and characters pop up and create themselves. And I like it that way. Because somehow in it all, I end up surprising and intriguing myself as well! For my novel, up until the last chapter and the epilogue, I had no idea whatsoever of what I was going to write. I just sat myself down and wrote. And every chapter was an adventure. Every writer is different and has their own trademark. So see what works best for you, discover your style, and go with that. Do you set yourself a writing schedule? Should I? In the beginning, I didn’t. Well, not specifically on paper at least. I made a resolution in my mind that I would write every day (ha ha ha). I’m grateful now that I actually had enough free time on my hands then that I was able to write whenever I felt motivated enough to. Now though, I have a much busier schedule and many more responsibilities, and so I find that dedicating a portion of my time early in the mornings works best for me. I can write with a fresh, clear mind and my mind is buzzing with ideas for the rest of the day. So, it really depends on you. If you’re a schedule person, then I applaud you. If not [and you’re more like me] then I wish you luck. It does take a while to learn what works best for you, but in the end it really does work wonders. How do I know my book will be unique and something readers will want to read? Now, that’s all down to you. Completely. Only you can guarantee if your book will be unique, and that all comes down to the ideas that you have in mind for it. The best thing to do perhaps would be to first narrow down what genre of books you’re planning on writing. Think of a target audience, as it is always good to keep in mind and gives you direction and focus. Then look up and read similar books of that genre, it will give you a good idea and taste of what others are writing about and how unique your book will be. Another point to definitely keep in mind is that you are YOU. No one else out there is you. Hence, no one else out there will ever write a book as you will. Some may be better writers than you, more eloquent, more appealing, more intelligent even [hey, I’m just giving you the real deal here…] but no one out there is YOU. So keep that in mind and write knowing that whatever you write will be unique. Is writing fun? Does it ever feel like a chore? Well, heck yeah. I don’t write because it’s boring. But, hmmm…at times, it can feel like a chore [like right now…just kidding!]. It won’t always feel like a walk through the park and at times you may want to bang your head against a wall. Or burn your computer to the ground. Persevere. Be patient. Focus on why you’re doing it, and you’ll live. Does it help to have a friend or mentor who supports your writing? So, I definitely recommend having a mentor, or even a writing buddy. And the icing on the cake is when you do it together for the sake of Allah. What is your # 1 tip on writing? Enough said. Once you put your trust in Allah, He will guide your writing, making it accomplish wonders, and then you will know that He is the ultimate friend and mentor and supporter that you can ever rely on. No one even comes close. So raise your hands and make du’aa, then write. What pushed you to finish writing your novel? How long did it take? 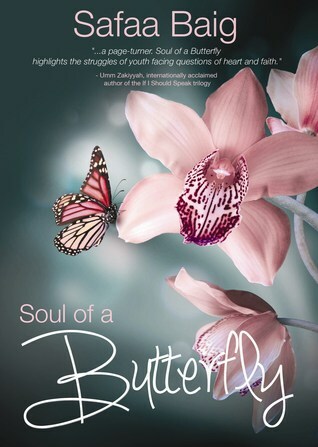 I started out writing ‘Soul of a Butterfly’ when I was 14 and still in high school and finished 3 years later, on the eve of December 31st 2010, just a day before 2011. [I like to think I live dangerously.] While I was still in school, I didn’t get to write much and it was only after I graduated that I truly pushed myself to finish, so the last half of 2010 was when 75% of the novel was actually written. What pushed me was my dream behind it all. I wanted to be the youngest Islamic writer in the world! Of course, once I came across Young Muslim Writers Awards I was completely dumbfounded (novels written at the age of 16 and under!) but by then, I was in too deep and enjoying myself too much. And I had a purpose for writing these books. What will guarantee success for a novel? Before you even consider sitting down to write a book, first think of why you are doing it and your purpose for writing it. This at the end of the day will determine how far you are willing to go and how much you are willing to invest into your dream. This will determine your success [or your failure]. If you’re doing it for the money, for fame, or perhaps because writing just gives you this awesome thrill, then congratulations! You’re like 99% of the ‘writer population’ out there. If you’re doing it for the sake of Allah, solely and sincerely, to spread the message of Islam into homes, countries, and all over the world, and fit into the 1% category of people doing this, then let me just say this: Success is guaranteed for you. There is no ‘if’, ‘but’, or ‘maybe’ about this. …and the success that you earn in this Dunya cannot even compare to the success that will follow you to your Aakhirah.